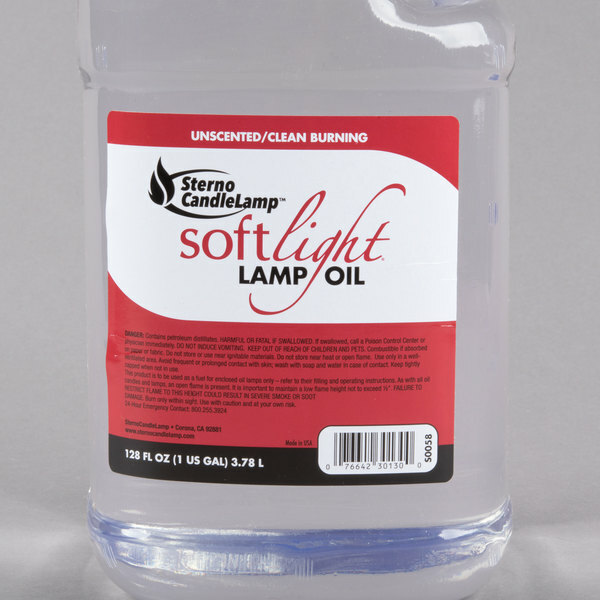 Use this Sterno Products 30644 Soft Light bulk lamp fuel to keep your refillable lamps and candles burning with no smoke or mess. Refillable wax lamps and candles have a huge advantage over conventional wax candles, offering the ambiance only a real flame can provide without the mess and smoke associated with those products...and they can be used again and again by simply refilling. 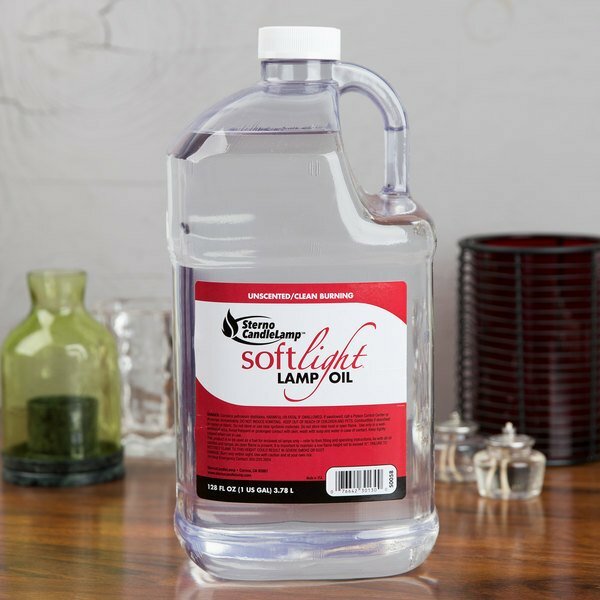 This 1 gallon bulk lamp fuel contains enough fuel to keep your business well-stocked, and to provide that perfect ambiance your customers expect! "One of the very best prices on the web for refillable fuel. This saves a huge amount of money overall versus the non refillable type." This lamp fuel works in any refillable wax lamp or fuel cartridge and provides hours of bright, soothing light. With 1 gallon of fuel, you will have enough to keep your business well-stocked. Made from 99% pure liquid paraffin wax, this fuel burns clean so that your customers are never bothered by the smell or sight of smoke. Traditional candles leave pools of hot wax as they burn. With refillable products, the fuel is contained in a way that this is not a concern. With refillable candle products, you purchase the candles once and then use the fuel instead of purchasing new candles each time. Because the fuel will last a long time, refillable candles and fuel can be a great way to get the experience of a real candle without their associated cost and mess. Sterno Products explains the importance of ambiance in your restaurant., and how simple yet elegant, tabletop lighting can affect your establishment's mood. 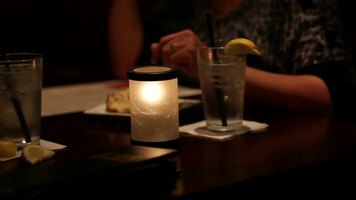 Create a unique atmosphere in your restaurant, bistro, or bar with these candles! 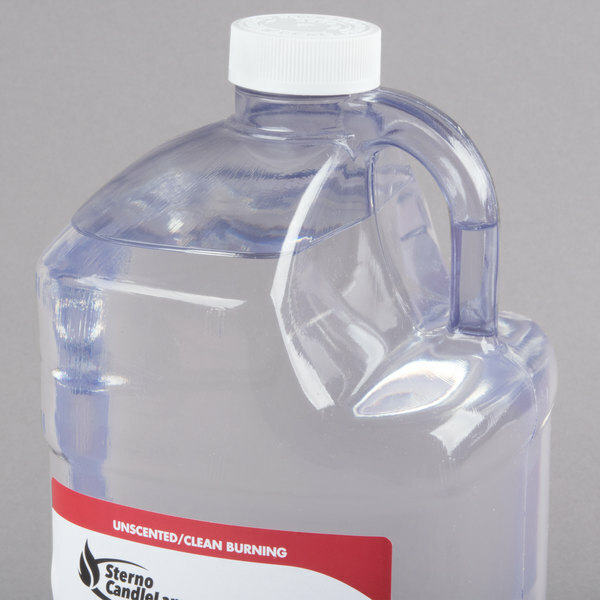 From clear liquid candles to flameless candles, Sterno Products has the right item to fit your needs. 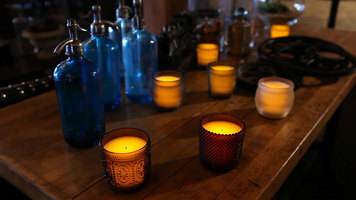 Set the mood in your establishment with the help of SoftLight liquid wax candles! They're sure to add just the right amount of ambience to dining areas. My name is Kenny Bowers and I am the Chef owner of Kenny’s Wood Fired Grill in Addison, Texas. Honestly, there is really three main things to a restaurant, you’ve got the food, you’ve got the service, and then the rest of it is ambiance. Ambiance is everything, because it affects the way the food looks, it creates energy. Lighting is huge, what we do is we shut the blinds to darken everything out, almost like you’re in Vegas, then we lower the lights, and put the little lamps out on the table. When you add the lighting it totally changes the whole mood and ambiance of the restaurant. It has a big effect on it. One of the things I love about table top lighting is the fact that when our restaurants get really busy, and when people sit down at the table, everything is kind of dark around them and once you sit down it becomes very intimate and you almost forget about what is happening around you. It's no secret that the right lighting can make the difference between a good experience and a great experience for your guests. As North America's ambience leader, SternoCandleLamp provides our customers with the most complete line of illumination solutions. Our products include soft light clear liquid candles made from highly-refined clear liquid paraffin that provides real flame ambience without messy drippings and time-consuming clean up. Our filled glass line includes five and eight hour petite lights and the always-popular Euro-Venetian six color options. And of course, nothing makes a more welcoming first impression than the natural glow of traditional wax candles. 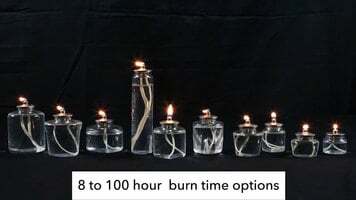 There are always situations where the use of open-flame candles is not an option, and this is where SternoCandleLamp flameless candles deliver the most realistic, life-like flicker effect on the market without any of the limitations of live candles. These products open up a world of design possibilities that can be used anywhere at any time. You'll love the flexibility to put candles against walls or near drapes, in a crowded hallway, or even in an unattended bathroom. If it can be envisioned, it can be done safely with SternoCandleLamp flameless candles. Regardless of what you choose, soft light clear liquid candles, filled glass, traditional wax, or our newest line of flameless candles, you're sure to find the right ambience solution for every space. For more information about all our ambience products, visit sternocandlelamp.com and follow us on Facebook and Twitter. Sterno Products SoftLight liquid wax candles come in a number of shapes and sizes to fit your needs. They provide real flames without the mess of traditional wax candles, and are available in 8 to 100 hour burn times. I purchased this to use outdoors. I was hesitant at first for fear of messing up my outdoor lanterns and torches but they worked perfectly with this liquid paraffin wax. Truly is smokeless and provided enough low lighting for my deck and guests. This stuff it awesome!! We bought this to fill oil lamps at wedding, I was so concerned that it would have smell or give off smoke especially since the lamps were on guest tables. It had zero smell and zero smoke! Other than the flame you could not even tell there was oil in the lamp at all. The price is fantastic too, not a cheap oil that burns out fast. I've been using this fuel in my various oil lamps (Dietz hurricane lamps and a dual wick oil lamp). The fuel burns without issue and does not stink like the K1 type fuels. This product was great but weI decided that this product wasn't good for us because we just didn't have the time to refill candles! We switched it out for ready to go liquid candles that would be disposed at the end of their life. I purchased this product from your company. I researched for it and you had the best prices anywhere even including shipping. burns clean and beautiful. This is cheaper than a name brand and usually burns as clean. Sometimes there is smoke which seems to be caused by a combination of air (wind blowing) and wick. But if the air is calm and the flame isn't too big then it burns pretty clean. This is the best fuel to use for candles and/or table decorations. I would recommend the use of fiberglass wicks over cotton wicks since the former do not "burn" at all and are therefore almost permanent in their life-cycle. I use this in oil burning lamps that are specifically designed for paraffin wax. I have not used this in a "hurricane lamp" or similar product and do not know how it would react. 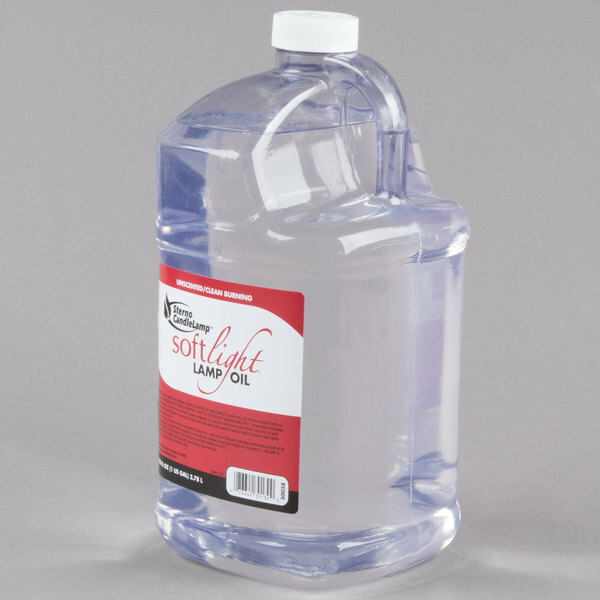 I would not recommend this in lamps of that purpose and use this only in items that are specifically designed for this type of oil. I would recommend this product. The only thing I would like to see is an optional "scent" since fragrances add appeal during the dining experience. This product has no odor or scent when burning. The oil hassaved us a bunch of money and the cheapest on the net. A very good buy and we will be buying again, for sure. I have order this liquid paraffin twice now. The product is Excellant and has met all my expectations. Shipping is very fast and customers service is a Joy to work with....5 Stars! Great company. Fast shipping. We're very satisfied with the service we received from webrestaurantstore.com and will order in the future from them for our liquid paraffin needs. Very good, we use it almost every day and have no had any issues with the product since purchase. I will recommend this to anyone. I have purchased this lomp oil many times from webstaurantstore.com many times. It is the best deal in town. I use it in all of my oil lamps including my Aladdin lamps. This burns white hot with no odor in all lamps. Never get suckered into buying 'aladdin' only oil. This is the same. I would give six stars but that was not an option. Regards, Thomas from PA. This is great fuel for refilling candles! Great price for four gallons!! Sure to last a long time!! Burns longer than most conventional wax candles!!!! This works great, I have a candle that is made out of stone and I couldn't find any liquid that would work. I stumbled on to your web site and found this product and it works wonderful, no fumes or smoke. This oil works great in oil candles and is very economical compared to other specialty oils. The only difficulty is putting the oil in a container with a better pour spout. I was so pleased to find this in Gallons and at a Great Price. Thanks so much for having it available to us~ the party was successful because of our lighting. Product is good quality and the price was reasonable so overall was pleased with this product and may return for future order when this one is used up. 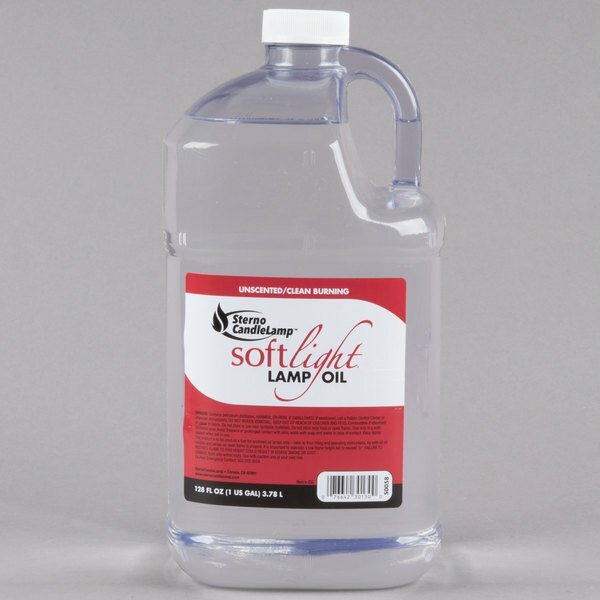 This product is an excellent odorless and smokeless solution for oil and table lamps. 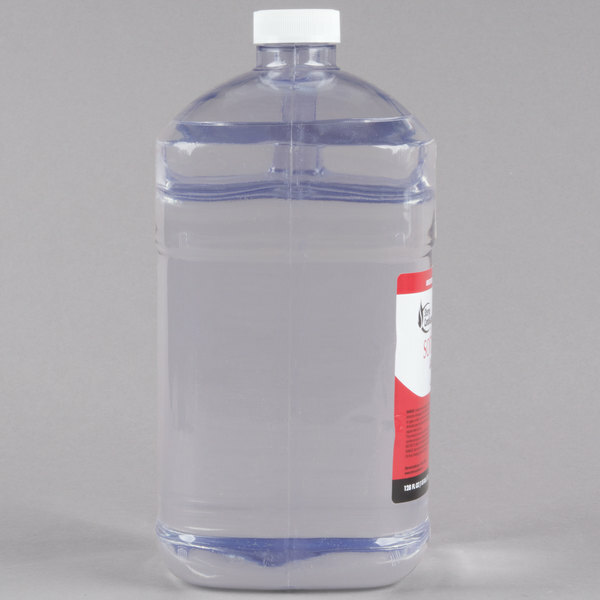 WEBstaurantStore.com has the best price on the gallon size that I could find.